If Guy Black’s find of the unknown airman’s album was a startling piece of luck, it did in fact reflect his abiding and alert interest in historic aviation. Similarly, recovery of yet another airman’s album came partly by luck and partly from my own endless 211 Squadron searching—albeit with the addition of a fair dollop of rather uncharacteristic patience. So it was that, in late 2005, an old leatherette album arrived in the post. With a Middle Eastern design tooled into the cover and a photocopy of Halley’s brief 211 squadron history tucked inside, the album carried no name, nor was original owner known to the seller. The album was made up of 46 pages (two of them blank) of assorted black and white photographs, from personal camera contact prints to official Squadron prints. The album was carefully titled and dated in a more or less contemporary hand, the pages running from November 1938 through to August 1940. The album’s owner was plainly being depicted in the embarkation photos of the opening page, and appeared elsewhere throughout the album. On two Squadron prints made for distribution, the name Wingrove had been written on the rear, while in another, part of that same name was visible on an RAF kitbag. A year passed and then a named photograph of the owner came to hand, from an entirely independent and quite unexpected source. 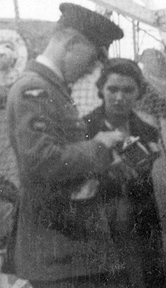 There is now no doubt that the photograph album once belonged to Aircraftman Ralph Wingrove, a young RAF Wireless Operator who left England aboard SS Neuralia on 5 November 1938 for service with 211 Squadron in the Middle East. From the start it was clear that he remained with the Squadron until at least August 1940. Wingrove (like Geoff Grierson) took much care with his photographs and gave the pages on which they were mounted quite full titles and dates. Beyond that, the details of Wingrove’s life were initially scant. His cap is of the old style issued to airmen. On his right sleeve, a badge that can only be the Wireless Operator’s fistful of sparks (the Air Gunner still wore a distinctive winged bullet at this early date). With no other visible trade or rank insignia, this man is an RAF Aircraftman and with his W/Op trade badge already up, an AC1 (Aircraftman 1st Class). Wingrove’s album included a great variety of photographs, the smallest a number of 1¾x2½in contact prints. While a number of 6x8in prints of what were probably official images had unfortunately already been disposed of, scans were available and the subjects were mostly not of 211 Squadron subjects. On inspection, it was clear that the album recorded service in the Middle East with 211 Squadron, from the dates, places, aircraft codes, and the fact that several of the shots were also to be found in the collection of other 211s, Geoff Grierson among them. 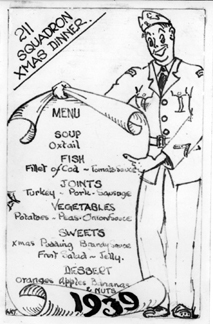 Several were examples of the duplicated prints made for Squadron personnel of festive occasions menus or group photographs. Two of these prints, from quite different occasions, carried in different hands the same name written on the reverse for distribution: Wingrove. In another personal shot, his kitbag is shown, with his name partly visible. 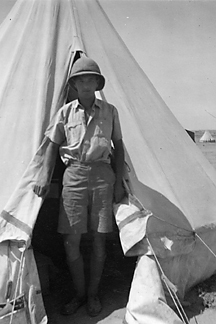 What follows is a representative selection from Ralph Wingrove’s 1938-1940 photo album. Wingrove's fistful of sparks badge is again just barely visible above the newspaper of the young man on the left. A happy young group. Wingrove’s two companions smile broadly for the lens: either close family or close friends. 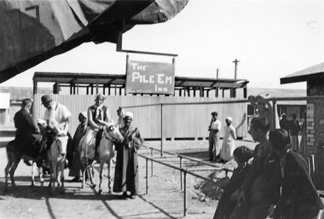 With excellent timing, Wingrove reached his Squadron, then at Helwan, in time for the usual Christmas entertainments: football in fancy dress, donkey races and of course the beano itself. 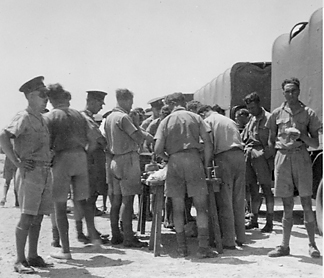 The 211 lads shared Helwan with 45 Squadron. Here they visit the scene of 45’s groundcrew Christmas jollies, The Pile ‘em Inn. The joke is on 45 Squadron aircrew. The groundlings have mocked up a fine “pile up” of K7777, a Wellesley on Squadron strength, which twice in 1938 had disgraced itself in landing accidents. One of the final batch of 80 Wellesleys delivered between February and May 1938, L2650 ‘G’ had served with 14 Squadron before being issued to 45 Squadron at Helwan. 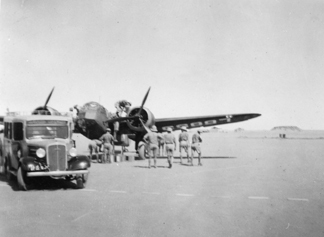 By the outbreak of war the aircraft had passed to 47 Squadron in The Sudan, where it was destroyed in the Regia Aeronautica air raid at Gedaref on 16 October 1940 that destroyed all eight Wellesleys of 47 Squadron’s detachment there. 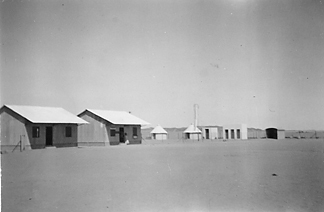 Wingrove placed this among his last set of Helwan shots, dated between the 31 July run out to Mersa Matruh and the final movement to El Daba on the eve of war in August 1939. It may show the packing of one of the 10 Hinds sold to the Royal Afghan Air Force in July. The last digit of the serial is all the identity that is visible—the aircraft might possibly be K6853. 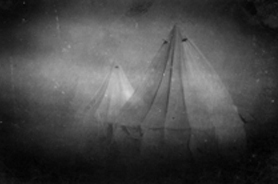 A similar shot, almost certainly the same day, lies among Allan Farrington’s photographs. 211 Squadron Operations Record Book 1 January 1939: “It has been decided by the Air Ministry to post 45 (B) Squadron and 211 (B) Squadron to Ismailia”. The move was carried out in three phases and was completed by 27 January, having been carried out under conditions as close to war-time as they could manage. When war did come, with more practice under their belts and more urgency, they moved more quickly. 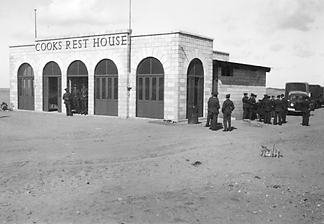 The standard of the day for international travel: Thomas Cook and Son’s Rest House, available to the travel-worn by air or road. 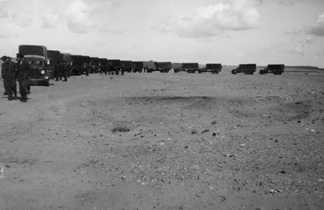 Known to the RAF as Half Way House - the 90 mile journey from Helwan through Cairo and the desert to the Suez Canal and Ismailia was quite long at convoy speed. Plainly the same occasion. This print turned out to be a cropped version of the original shot, of which an apparently full-frame print had by late 1940 found its way into my late father’s collection. The convoy of Fordson 3-tonners is led by a heavy utility or staff car, perhaps a Humber. 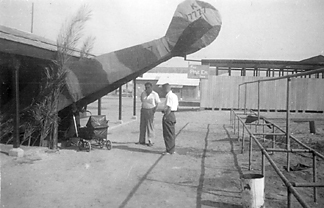 Apparently taken at the lower platform level of the airship mooring mast at Ismailia. The railing and view below are consistent with two other captioned shots from the tower on the same page. Wingrove's fistful of sparks badge is barely visible, but it is there. There is no other indication of rank. 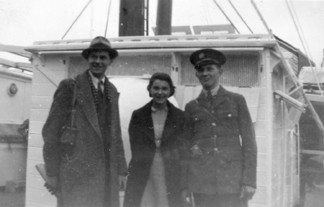 Unnamed airman companion on the right. Either Wingrove is a tallish fellow, or his companion is very slight. And the clincher: the railing of the lower platform, faintly visible here, is clear enough in the original little Velox print. 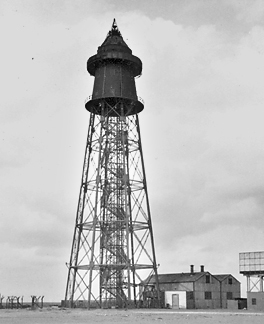 They took another, less satisfactory, shot from the top enclosed platform on this dull day. 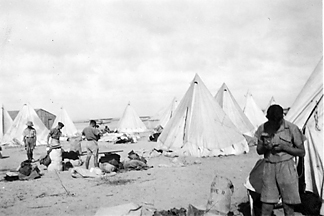 In late April they were ordered to their desert war station, Daba, in view of the Italian annexation of Albania. S/L Judge had just taken delivery of the Squadron’s first Blenheim, very possibly a dual control model. In the right foreground, Wingrove’s kitbag, his name partly visible. An unnamed shot but of the common fashion, seen on the pages of Dundas, Fryatt, Abbs: surely the album’s owner. 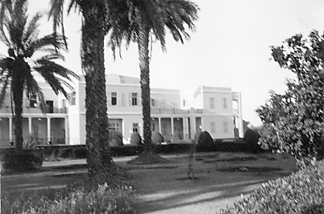 By May 1939 a move back to Ismailia had been ordered, to complete the Blenheim conversion. Despite assorted shortages, they had worked up sufficiently with their “new” aircraft to be able to take part in local Blenheim Delivery Flight work from 19 May onwards. 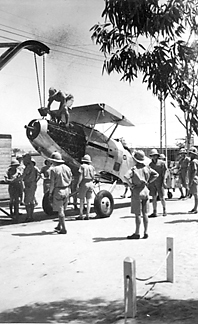 These trips were something of a jaunt for the aircrews selected: a worthwhile experience and a considerable break from the Desert routine, whether the task was to collect from the UK or to deliver locally. In May and June, the Squadron undertook a total of 5 BDF exercises, ferrying 18 aircraft in all to Aden. 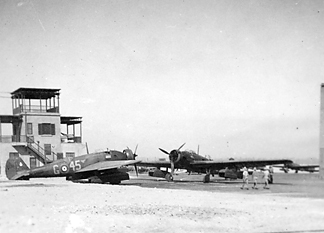 Wingrove took part in the last of these flights, delivering L6653 to 8 Squadron at Aden via Wadi Halfa and Port Sudan. Still at midday: the windsock utterly lifeless. The journey was certainly one of contrasts. 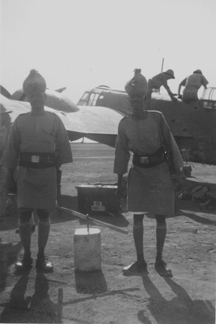 Testing work for the ground lads: refuelling with 4 gallon tins and the chamois-filtered funnel. Blenheim I L6653 survived with 8 Squadron until 1 June 1943. 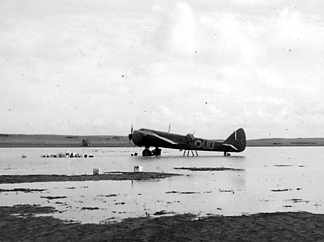 The aircraft was one of the AV Roe & co batch of 250 delivered between August 1938 and March 1940. 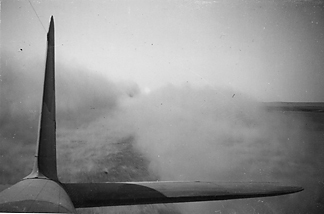 A marvellous early morning shot from the turret aft. There was a little room in the Blenheim for passengers. 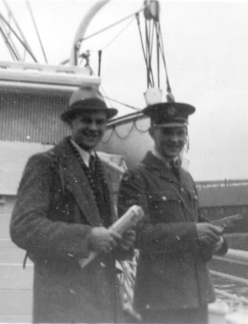 Here two Aden servicemen wait. There is personal baggage behind them. Between them is an aircraft tie-down: apparently a cement block moulded by the ever-versatile 4 gallon petrol tin. On arrival in Aden, there was some hint of luxury in the hotels of the main street, but perhaps the main attraction of this aircrew “jolly” was the trip back: a few days aboard a passenger liner back to Egypt, in this case the P&O line’s RMS Cathay of 15,000 tons. Apparently passing unremarked in the Squadron diary. Soon enough, the sand and dust were to return. But not before war was declared. 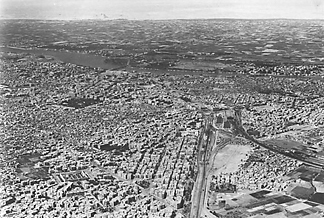 “El Daba 3 September 1939. Signal received 1530 hours to the effect that England had declared war on Germany only”. 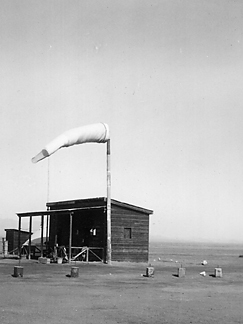 By the end of September, the ORB was recording the effects of the sand storms on aircraft serviceability, even rendering the bomb-release gear u/s. A Squadron generally had a talented artist to dash off little home-grown treasures like this. In the days before the plain-paper copier became commonplace, a photocopy was exactly that: a photographic print. At the bottom left, Wingrove’s name in capitals. 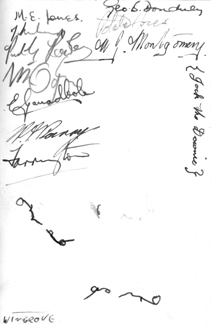 The signatures on the rear include from top left: ME Jones, three illegible names in indelible pencil, E Garrad-Cole of Ticket to Rome fame, Parry and Allan Farrington. 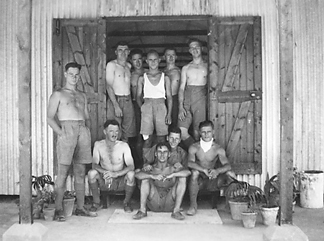 On the right: George Doudney, “Potato” Jones, Montgomery, “Jock the Downie”, an LAC Gunner. Below the autographs, a shorthand phrase has been carefully executed twice—it seems to refer to races: perhaps someone thinking of “Porpoise” Bax’s famous £30 win on a 10 bob bet at Alexandria races a few months earlier (the winnings equivalent to about a month’s pay for a Flying Officer). Wingrove’s name also appeared pencilled on the back of his copy of the formal ‘A’ Flight print taken about August 1940, with Farrington in command. Originally the album held three prints of Collier’s famous crash on night exercises. This one remains. P/O CPR “Pete” Collier and his passenger LAC CE Thomas got away with it, evacuated to 2/5 General Hospital by 216 Squadron at dawn. Here the delicate front office of Mark I L1486 is looking decidedly second-hand. 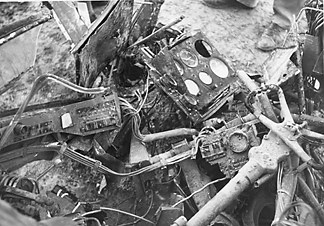 In the right corner, the control column leans, above it to the left centre the smashed instrument panel, bottom left corner lies the throttle and mixture quadrant. 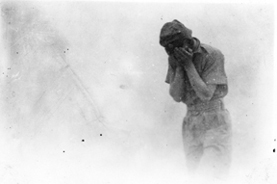 An airman stands close, top right. Photographs of the accident were held by a number of Squadron lads: Cooper, Grierson (with a fuller account), Hoyes, Sainsbury, and Sharratt. On 22 July 1940 Sgt GB Smith (Pilot), Sgt RA Steele (Observer) and Sgt GA Sewell (WOp/AG) took off at 2130hrs from Quotafiya in Blenheim I L6661. Three aircraft of 211 Squadron were operating individually that night, against El Adem (Smith and co), El Gubbi (Sgt Peck and co), and Tobruk (The Bish and co) harbour. Smith’s aircraft was last seen over Sidi Barrani. 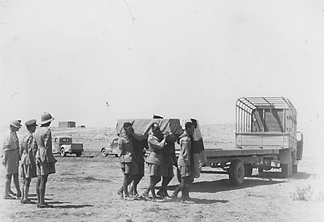 Sgt Sewell’s body was washed ashore near Maaten Bagush, from where he was returned to El Daba for the final honours. Smith and Steele were never found. 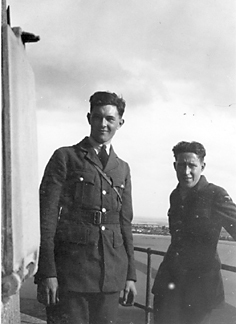 These two men were well known to Ralph Wingrove, who had flown as Gunner with them on 10 July. He may also have flown with them in June, though the Operations Record Book is frustratingly blank for this period. Smith, Steele and Sewell were the Squadron’s first fatalities in action. 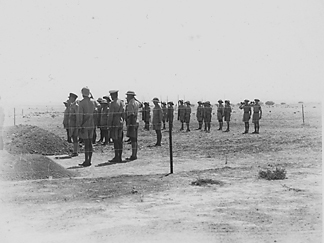 Today, 530961 Sgt George Aidan Sewell lies in El Alamein War Cemetery, with his missing crewmates commemorated on the nearby Alamein Memorial, thanks to the Commonwealth War Graves Commission. Rescuing Ralph Wingrove’s album from potential oblivion was a wonderful piece of luck. His photograph collection, if light on aircraft images, tells a rich story of the Squadron’s Desert Days. The RAF Personnel Management Agency is bound by various provisions that limit release of personal particulars, except to an airman himself or his next-of-kin. In this case, they were kindly able to confirm at least that Ralph Charles Wingrove had enlisted in the RAF on 12 October 1937 and had been posted to No 211 Squadron RAF in the Middle East from 16 November 1938 until 18 October 1940. The Squadron’s Operations Record Book shows that by then he had carried out at least 18 operations in the Western Desert and had deservedly risen from the rank Leading Aircraftman (in July 1940) to Sergeant (by 1 September 1940) following the regularisation of permanent aircrew musterings and ranks that came in 1940. He had flown as gunner to F/O Ken Dundas, F/O Alan Farrington, and most often for The Bish (with Sgt Richmond as Observer). By early 1945, Ralph Wingrove had advanced to Warrant Officer and was with No 1653 Heavy Conversion Unit. 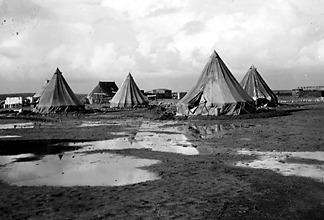 The HCU had existed in various forms since January 1942, before moving to North Luffenham on 27 November 1944 to re-establish with 32 Lancasters as its main equipment. In March 1947 it was re-designated, as No 230 OCU. Duty: training. Aircraft took off North Luffenham for fighter affiliation. Lost control and crashed at 1515hrs near Scraptoft on the eastern outskirts of Leicester. The six crew were all lost. Lancaster ND647 was a survivor of operations with 49 Squadron RAF. On a bridge very close to the fatal crash site at Scraptoft, near Leicester, a small memorial plaque—replaced as recently as 2006—commemorates the event. Ralph Wingrove and his Pilot, F/O Norman Edward Cook of Hockley in Birmingham lie next to each other in the beautiful grounds of Oxford (Botley) Cemetery, where many World War I and World War II casualties rest. The other lads were claimed by their next of kin. A search of the British Telecom Directory suggests that no Wingrove family members remain in Bedford Park. Son of Percival Charles and Elsie Winifred Wingrove, of Bedford Park, Middlesex.